The province’s child and youth advocate says more than 6600 students in this province miss at least ten per cent of school days every year. One of the biggest reasons is they are going hungry and do not have enough food to bring for lunch. “The Salvation Army Community and Family Services food bank provides food for between 450-500 individuals monthly, and many of those are children in food-insecure families,” said Hicks, the church’s the housing support officer in Gander. Back in November, she was in a school when she heard a student say another child was “lucky” because they were eating Halloween candy and chips for lunch that day. When the school put her in touch with the parents, she learned the absences were because the student didn’t have enough to eat for lunch. “What that looks like is they’re going to school, potentially, with no lunch. I think it’s much easier to recognize in the lower grades,” she said. Hicks has three children herself, so she started making an extra lunch each day and dropping it off at the school for the child who didn’t have one. Now she has 30 students in all grades in what’s become a new school lunch program. Although she works with families in need every day, Hicks was still surprised by how many kids don’t have enough to eat. Hicks says some kids were unfamiliar with things like carrots or cucumber. They can be expensive to buy and the parents couldn’t afford it, especially if much of their food comes from the food bank. Under Hick’s program, the lunches are made by recess time and are dropped off at the school offices, where each bag is labelled with the student’s name. Students just go down to the office to pick them up, the same as any kid who forgets a lunch and has mom or dad drop it off. Hicks says it’s important for the students to feel inconspicuous. The biggest problem now is the cost. Hicks has already gone through her small budget and now the program is covered by the church’s general funds. That can’t go on indefinitely because that money was already earmarked for other projects. So now she’s looking for sponsors and donations to keep the lunch program afloat. On the Avalon Peninsula, the School Lunch Foundation provides food in 33 schools. They’ve moved into Clarenville this year, which marks the first year a school outside the Avalon joined the program. Ken Hopkins is the foundation’s executive director. Under the foundation’s program, families sign up for the plan, and agree to pay what they can. Payment is handled discretely so nobody knows who paid how much, even if it’s nothing. Programs like the one in Gander fill a need, but they use a lot of local resources. And food banks aren’t really an option to fill the gap. 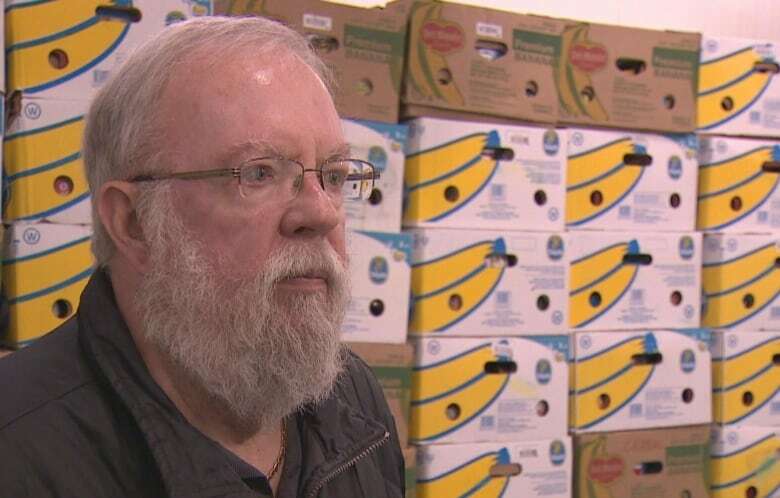 Eg Walters runs the province’s Community Food Sharing Association.